Nodes (Junction) connects streams of the same type such that the sum of all flows in is equal to the sum of all flows out. Each node is only visible in a layer of the model. These elements are used to add a node and link flows to the same. It is assumed that the unit for flows previously set to be thousands of Swedish kronor (SEK thousand kilo = SEK). Click on the icon junction (Junction) and and place the crosshair where the node should be. It can be moved by dragging it with the cursor. Connect flows in and out of the hub. Pull flows with handles on each end. Stipulate the value of so many streams so that it can be finally calculated. The result can be like this. 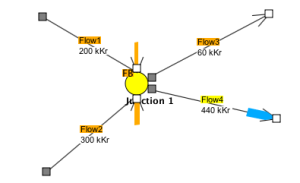 Prescrobed flows are marked with orange paint and calculated in blue. Final result: The whole process is shown in a video. Click on the image to see the video. For the best in full screen.